Proposals to move the Sunset Strip Music Festival from August to September and recast the Sunset Strip Farmer’s Market won the support last night of the West Hollywood City Council. In a report to the Council in February, city staffers had suggested putting this year’s festival on hiatus while it was re-evaluated. The report noted that the Festival has been losing money — $350,000 last year and $432,000 the year before. The festival, which began in 2008 as a celebration of Sunset Boulevard’s role in rock music history, is staged each year by the Sunset Strip Business Association (SSBA). The Association is funded by a tax levied on businesses along The Strip that are its members. Since the festival’s launch, the city has spent $540,000 to cover expenses related to police and fire services and erection of street barricades and has waived $46,400 in fees. Rather than put the festival off this year, a Council subcommittee composed of John Heilman and John Duran, working with city staff members and the SSBA, instead proposed that it be moved from early August to Sept. 19 through 21, when nearby hotels have higher vacancy rates. The subcommittee and the SSBA also proposed contracting with Nederlander Concerts to book talent, market, sell tickets for and otherwise produce the event. Nederland will receive 25 percent of revenues from the event and 75 percent will go to the SSBA, from which it will reimburse the city for the $125,000 that West Hollywood will spend to fund the event. 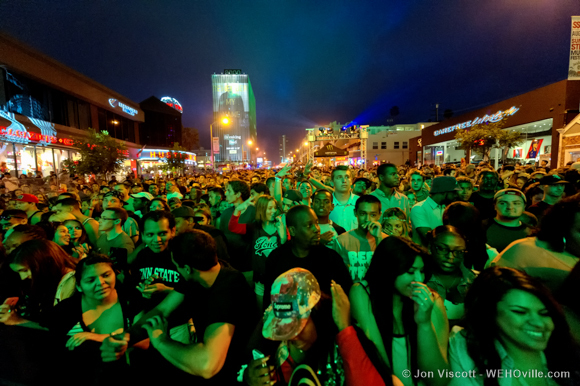 The festival is one of the city’s largest events, attracting as many as 15,000 people to see performers like Slash, Motley Crue, Linkin Park, Smashing Pumpkins and Joan Jett. The SSBA has struggled over the years to find an optimal time to stage the festival, trying to avoid scheduling during competing events and the hottest time of the summer. The SSBA also wants to schedule the festival when it will most benefit the hotels along The Strip that are its members. The Council also endorsed a plan to recast the Sunset Strip Farmers Market, although some Council members expressed reservations about the plan. The Farmers Market will shift its focus from having farmers sell locally grown fruit and vegetables to also offering wine, beer, pre-cooked food and other products. That change from a so-called “certified farmers market,” in which at least 50 percent of the produce must be sold by the farmers who grow it, is one of several steps the market will take to boost attendance and improve its finances. Among the non-agricultural vendors who already have signed up for this year’s market are Contessa Designs, a jeweler, and Simply Natural, which sells soaps and candles. The SSBA, which operates the market, will contract with Calamigos Ranch to manage it this year. Calamigos now operates the Main Street Farmers Market in Santa Monica on Sundays. The Sunset Strip market, which begins in May, will be one month shorter this year, ending in September. Also, the market will open at 5:30 p.m. rather than 6 p.m. and close at 9:30 p.m. rather than 10 p.m. The market, held during Thursday evenings at the city parking lot at 8755 Sunset Blvd., east of Holloway, first opened in 2012. A report to the Council by the city’s Economic Development Division and Community Development Department noted a decline in attendance at the market. An average of 600 people attended the market each week in 2012, dropping to 500 last year. Attendance has dropped sharply in the fall, when the school year starts and the weather is cooler. with an average each week in October 2013 of 180 people versus 350 in October 2012. The decline in customers sparked a decline in farmers last year from 33 in May to 10 in October. An audit showed the SSBA lost $215,000 on the Farmers Market in the 2012/2013 fiscal year. Last year the city gave the SSBA $50,000 to help fund the market in addition to waiving permit fees and not asking the SSBA to cover revenue lost from using the parking lot for the market. The Council denied the SSBA’s request last night for $25,000 to fund the market this year but will continue to waive permit fees and forgive the lost parking revenue. A report by the SSBA notes several challenges for the market. One is competition from other nearby markets, which include the Hollywood market on Sundays, the Helen Albert Certified Farmers Market in Plummer Park on Mondays and the Yamashiro Nighttime Market on Thursdays. The Sunset Strip Farmers Market has attempted to distinguish itself from those markets by operating at night and providing music and other entertainment. Another is attracting customers from a wider area. In a survey last year, 90 percent of the 150 respondents said they lived in the 90069 Zip Zone, which is where the market is located. The SSBA proposes that the city extend its Pickup Line free shuttle from Santa Monica Boulevard up Holloway Drive to Sunset Boulevard to make it easier for more West Hollywood residents to attend. A 2009 study by the SSBA found that only 13 percent of the people on the Sunset Strip during the evening are West Hollywood residents. The SSBA said shorter hours for the market and other initiatives it is considering are also likely to generate more business for nearby restaurants and shops. What about the book fair?